This document is intended to cover all information regarding the compatibility of various operating systems and hardware with Sage 300 2016, Sage 300c and 2014 (Accpac 6.2) and CRM. You should assume that any operating system not listed in this document is incompatible with the current version of Sage. Terminal Server and Citrix XenApp are supported only for Sage 300 Desktop (Visual Basic) programs, not for web screens. Sage 300 ERP 2016 is supported in VMware ESX and Microsoft Hyper-V virtual environments. However, please note that our support teams will address only application related issues that can be replicated in a physical environment, and will not address performance issues in a VMware or Hyper-V virtual environment. Because implementing a virtual server environment is very complex, we recommend that you consult with a vendor-certified virtual server consultant. The key is to have them commit to matching or mirroring performance requirements detailed in our hardware requirements section. A certified virtual server consultant should be able to provide you with a performance baseline report that includes expected maximum processing throughput per active instance, and expected performance trends as additional virtual instances come online. This document should also include the expected margin of error during peak business operating hours. When running in a VMware environment, avoid over-committing VM Application Pools. Allocating more resources than the hardware can support can cause performance problems. Each virtual environment should have sufficient resources for the operating system and installed applications. If not properly implemented, a virtual environment can be a single point of failure. A single point of failure should be avoided at all costs. The virtual server community always recommends deploying at least two virtual servers, along with a failover strategy. There is never enough memory to share among virtual devices running on a virtual server. We recommend that server RAM be configured to the maximum that the server hardware can support. Most server hardware that is certified by the virtual server vendor can support at least 32 GB of RAM. Virtual server vendors always support a list of compatible server hardware devices. Therefore, ensure that the virtual server your firm is considering is on the Hardware Compatibility List. Each virtual server vendor implements vastly different memory allocation strategies, so you need to be familiar with their specific strategy. For example, VMware dynamically allocates memory to an active virtual image, allowing the administrator to set a maximum memory limit, but allocating that maximum memory only as needed. Network bandwidth may become a bottleneck in virtual network environments. Be prepared to add more than four network interface cards to your virtual server. Ask your virtual server platform expert to investigate the ability of these network interface devices to “team up.” When network bandwidth becomes a bottleneck, network interface teaming may be the easiest solution, without resorting to the more complicated strategy of breaking up your network into smaller segments. At the time of writing, VMware vSphere endorses running database servers as a virtual instance. Sage 300 ERP has not been benchmarked to run the database server on a virtual instance in VMware, despite the vendor allowing this configuration. Sage 300 2016 does not support Pervasive. Sage 300 ERP 2014 supports Pervasive PSQL Version 11.2 or higher. Older versions of Pervasive PSQL (version 11 or earlier) are not supported. Sage 300 is NOT supported on computers running Windows XP or Vista. When Microsoft ended its support for Microsoft Windows XP on April 8, 2014, Sage also stopped supporting Sage 300 on computers using Windows XP and this includes product updates for existing Sage 300 ERP versions such as 2012, 6.0 and 5.6 running on Windows XP. Windows 2008 and 2011 versions of Small Business server are supported, but have not been tested. Due to the number of features included in Windows Small Business servers, we recommend that, for optimal performance, you install Sage 300 ERP on a separate machine. Windows Server 2012 Essentials (Small Business server) is supported but is not tested. The Analysis module for Sage 300 ERP Intelligence Reporting is not compatible with Microsoft Excel 2003. Sage is committed to supporting future Microsoft operating systems as they are released to market for all Sage 300 ERP applications. However, this does not include release candidates, beta or pre beta operating systems. As new operating systems are scheduled for final general release, Sage will evaluate their compatibility, and we will update this document based on those evaluations. Sage 300 does not support DCOM for Web Deployment. Sage 300 ERP Web Deployment does not require Sage 300 ERP Web Reporting by Crystal (Crystal RAS). Download the Compatibility Guide for Sage 300 2016 and 300C. Download the Compatibility Guide for Sage 300 ERP 2014. Database server Microsoft SQL Server 2008 R2, 2012 or 2014 on Windows Server 2012 R2 are supported for use as the database server. Microsoft SQL Server Enterprise, Standard, Workgroup, and Express Editions are supported.  For Microsoft SQL databases, we recommend using a binary collation method, such as Latin1_general_bin. Starting with version Sage 300 2016, Sage 300 only supports Microsoft SQL Server for all databases. See Microsoft’s websites for limitations of their databases. Microsoft SQL Server Enterprise, Standard, Workgroup, and Express Editions are supported. Starting with Sage 300 ERP 2014, Sage 300 ERP Portal database is only supported on Microsoft SQL Server. Microsoft SQL Express Edition may be sufficient to run only the portal database. See the database vendors’ websites for limitations of their databases. Thinking about project cost management? We can help with Cloud Hosted Solutions or call us at 866-436-3530 to discuss hardware leasing options. Opening Sage 300 Desktop (Visual Basic) screens from the Portal is supported only on 32- bit versions of Internet Explorer. Opening Sage 300 screens in a separate window using Sage 300 web deployment is supported only on Internet Explorer. Sage CRM 7.3B and integration with Sage 300 2016 are supported on Internet Explorer for both single- and two-server configurations, and on the latest versions of Google Chrome, Apple Safari, and Mozilla Firefox for single-server configurations only. Server requirements To support Sage 300c web screens, the Sage 300c server requires Microsoft Windows Server 2012 R2 with IIS installed, including static content and ASP.Net. Sage 300c web screens require a Portal database, which can be the same database you use for the Sage 300 Portal. The Portal database must use a supported version of Microsoft SQL Server. Web browser requirements To view Sage 300c web screens, use Internet Explorer 11 or the latest versions of Microsoft Edge, Google Chrome, Apple Safari, or Mozilla Firefox. Sage ERP Accpac Version 6.0 requires Pervasive PSQL Version 10.2 or higher. Sage ERP Accpac Version 6.0 does not support older versions of Pervasive PSQL (Version 9.7 or earlier) or Oracle (Version 10.0 or earlier). Windows 2003 and 2008 Small Business server are supported, but remain untested. Due to the number of features included in Windows Small Business servers, we recommended that, for optimal performance, you install Sage ERP Accpac on a separate machine. The Analysis module for Sage Accpac Intelligence is not compatible with Microsoft Excel 2003. Sage is phasing out support of DCOM for Web Deployment in favor of .Net. Although DCOM is supported in Version 6.0, .Net is the preferred method. With the release of Sage ERP Accpac Version 6.1, DCOM will no longer be supported. * Financials Modules include: System Manager, General Ledger, Accounts Receivable, and Accounts Payable. Operations Modules include: Inventory Control, Order Entry and Purchase Orders. Oracle Enterprise, Standard, and Standard Edition One are supported for company and system databases. Oracle is not supported for the portal database. Only the WE8MSWIN1252 code set is supported in an Oracle environment. The following information is intended to cover all supported platforms regarding the compatibility of various operating systems with Sage ERP Accpac Version 6.0. You should assume that any operating system not listed below is incompatible with the current version of Sage ERP Accpac. Sage Customer Support Services supports Sage ERP Accpac only on platforms that are listed as supported in this document. You can submit requests to support additional operating systems, as well as your suggestions for enhancing the product, to Sage ERP Accpac Ideas. Microsoft Internet Explorer Versions 7 and 8, only. 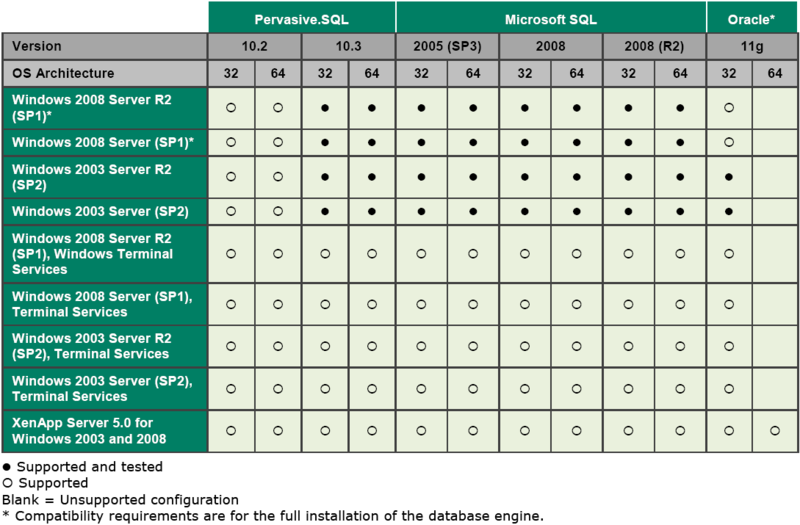 Microsoft SQL Server (including Microsoft SQL Server Express) and Pervasive PSQL. Note that the portal database can use a different database format than the company and system databases. Internet Information Services (IIS) Version 6 or 7. (IIS is required for the web server). Printing in Web Deployment requires Sage ERP Accpac Web Reporting by Crystal. Currently, Web Deployment ships with Crystal RAS XI R1, while the regular deployment uses Crystal Reports Runtime Edition XI R2. Sage ERP Accpac Web Reporting by Crystal is not supported on Windows Server 2008 and 2008 R2. Previous versions of Crystal Enterprise are not compatible with System Manager 6.0.